Sliders Archives - Burgers, Dogs, & Pizza, Oh My! (Update, these are apparently no longer available. Potato “strips,” grits, or beans are the alternative choice to fries at present). Hit up Krystal to try one of their latest offerings, Seasoned Waffle Fries, and of course, I needed a couple sliders to ‘wash’ them down with. After decades of contemplation about it, I think I prefer the Krystal burger to White Castle. Can’t say why, maybe it’s the pickle. So I can’t really give a fair assessment of them, since I doubt they were prepared as corporate would have preferred. A few years ago, I checked out Krystal’s mini hot dogs. In this very same city, as it happens. Sliders, gut bombs, no matter what you call them, the small square burgers cooked on a bed of onions, are a distinctly American tradition. The White Castle chain was one of the first fast food establishments, started in 1921 in Wichita, Kansas. Sliders were originally a nickel until the 1940’s, then 10 cents for a long time after that. Today, a single burger is 68 cents and the menu has been expanded to include breakfast sandwiches, chicken breast sliders, and a couple of very unique items, “chicken rings”, and “fish nuggets.” (pictured below). Four burgers, an ample size fries (crinkle-cut), and medium drink will set you back less than five bucks, and there are various other combination meals with come with larger quantities of burgers. They even sell a one hundred pack. Some folks say White Castles taste best when it’s the middle of the night, and one has indulged in too much alcohol. But I’d take exception to that. The only time I ever had Mrs. Burgerdogboy in a White Castle, we had indeed consumed too much alcohol, and while the burgers tasted just fine to me, the stainless steel bench proved the perfect resting place for her pretty little passed out head. But I’ll even eat them sober. I love ‘em. Johnny Rockets is the latest to add to the slider craze, now offering mini burgers, dogs, and chili dogs. The new Slider Hamburger options include the Traditional Slider with mayo and pickle slices or one of four new Johnny Rockets sauces: ancho-chipotle with a smoky pepper flavor, sweet pepper relish mayo, dijonnaise sauce with a hint of horseradish and chunky bleu cheese sauce. 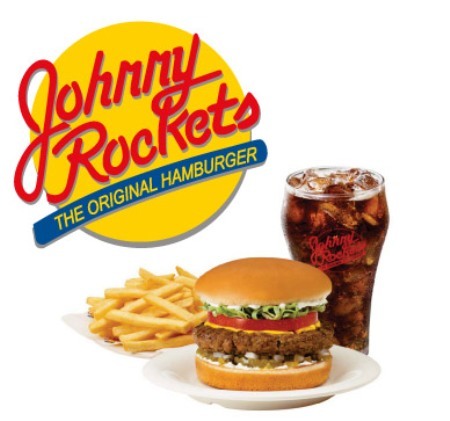 Johnny Rockets has over 250 locations in 11 countries. Stopped in this place I had previously spotted on a drive-about, about an hour north of Portland on the road to Astoria. St. Helen’s is an old, old shipping port on the Columbia River, and the Klondike was originally a rooming house for sailors and mill workers. It being between lunch and dinner, we eschewed the entrees, and ordered a half-dozen appetizers to share. 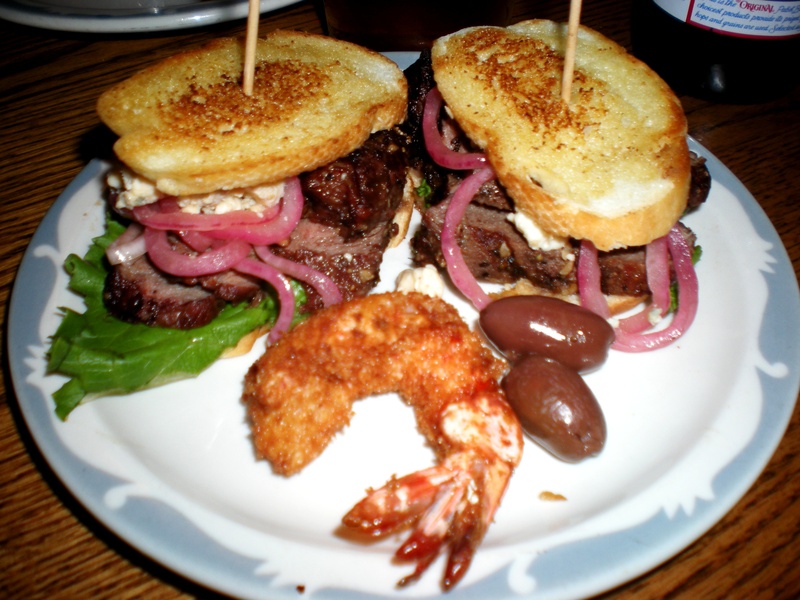 Klondike’s version of sliders was flank steak, with chunky bleu cheese and pickled purple onion curls on a baguette. It (and everything) was delicious. 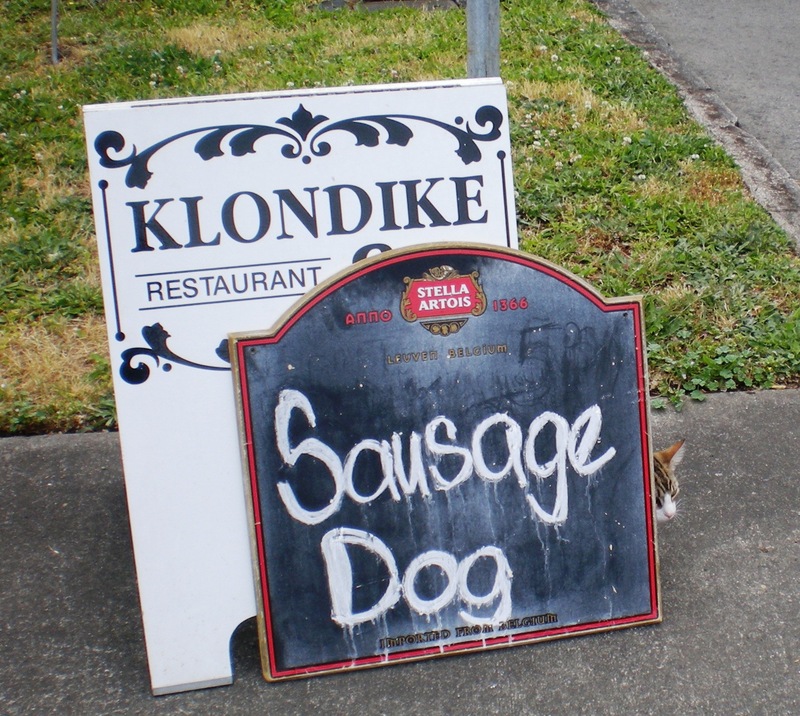 The special of the day was a “sausage dog” (see pic below and note potential victim hiding under the sign), which we passed on when they told us it was from Zenner’s, a local Portland dog company. Zenner’s makes great products, but this was billed as “andouille”, and we’re always disappointed with andouille outside of Louisiana and/or France. If you’re ever in this area, checkout the Klondike. Great menu. Fun staff.